Here is my elephant…..this was my first attempt at anythingvpaper mache since I was very young….the clay went much faster although I think I put the first layer on too thick….took a while to dry and the mask is a little heavy but other than that it went ok..thanks fir such a great pattern…. jack and sally from the movie nightmare before christmas . Very nice! And two of my all-time favorite movie characters, too. Thanks for sharing. I found your toilet paper clay after I’d completed a project with Grades 7 & 8 using regular flour/water paper mâché paste. I’ll never use that with a class again. I had made a huge bowl of paste and one of the students knocked it upside down on the floor. Ugh. When I found your recipe I decided to try it at home first. Haha, you opened a world of possibilities with that clay. I started with making a hobbit house out of pop bottles. Then proceeded to use it to make fun, whimsical pieces using old jars and then a wine bottle. They all were so much fun and easy to do. I tried making my own house from cardboard and going for more realism. End results were great! I have used this clay now for Grades 2-6. Making masks and making hobbit houses. The kids had a blast and there was no real mess. One tip I had discovered: give each student a finger bowl of water to dip fingers and utensils in and the clay stayed on the projects. I love how the texture gives the look of wood or rock when dry brushed. Hi Tracy. Thanks for the tips! Unfortunately, your photo didn’t come through – did you edit the size so it’s less than 250 KB? I was wondering if it would stick to plastic, but luckily your post has answered my question. Thank you! Hi! I am María. I am doing a series of opera singers. Each is going to be different. I am having trouble with the hands and the facial expression. I need a very dramatic face yet simple. Any ideas? Photo of my paper mache elk. Trying “Lily in Wonderland” again. Yay, it worked! And it’s so sweet. Thanks for sharing, Mister Shelbot. Jonni, how is my favorite artist? Forgive me for wasting all of your space, but it’s been a while. Teresa, your turtles are terrific. Hanna, PLEASE try again to post pix of Lord & Lady Von Deerington. Michele, can’t wait to see the lamps (or anything) made by your art class. Elwin, I hate having to buy two of something, but I really hope you use a mixer dedicated to paper mache/non-edibles. Kathy, PLEASE show us pix of your elephant mask and lion when you can. Hi, Joyce. Miss you both. Rex, you always remind me of the song “Nobody Does It Better”. I love your pulchritudinous piggy. Leanne, this probably isn’t what you had in mind (and the picture is awful), but this is “Lily in Wonderland”. If it doesn’t post, I’ll try again. I, too, would love to see other artists’ pix of “Alice…”. I know someone made a wonderful, large “Mad Hater” that they posted on the UPM page. The Mad Hatter comment image is here. I can’t believe I forgot about it, but it has been several years. Thanks for reminding me. And no, sadly, your photo didn’t come through. We want to see it, really we do. Could you give it another try? I know I keep claiming that I’ll fix the system to make it easier, but I just haven’t had time yet (and a fast read-through of the code got me nowhere, of course). Shelbot! Wonderful to hear from you, we missed you! Can you believe all the fabulous work on this blog? It is mind boggling. I love your Lily in wonderland. Very sweet. Is it a recent piece? I always think of that song “come on Eileen” when I think of you….do you understand how you enter peoples psyche? Don’t be a stranger! Did anyone do an Alice in Wonderland sculpt? 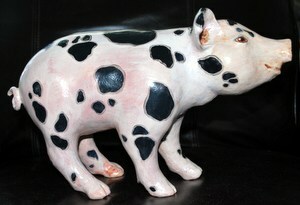 My latest pig. I love making pigs, but I end up frustrated because I can’t get the eyes right. Anyway, this is for a family where we trespass on their property every day walking. They have been really good about it for a long time and are getting ready to move into their new home. I thought it might make a house-warming gift. Rex, this little pig turned super! I know you were nervous about the paint job but I think you did a stellar job! It has a ton of personality, just like the creator! Jessie will be proud that you take her advice seriously. I love your pigs. I think as soon as I am able I am going to try making one. I am making the elephant mask and lion…I have both about ready to cover in clay but I noticed the elephant said to wrap the entire mask in masking tape but the lion does not…do I need to wrap both in masking tape? Hi Kathy. No, you don’t. The cardstock that I used for my elephant is very light, and it needed to have the plastic over it to keep the cardstock from getting wet. But paper mache clay won’t stick to the plastic, so that’s what the masking tape is for. The Lion is on much heavier cardboard, so it doesn’t need to be protected from the paper mache. I hope that helps explain it. Those two patterns were made four years apart, and that’s why they’re so different. Hi Jonni! Thank you for the quick response. No I believe it is a combination of paper pulp and sawdust. Not really sure. I think it’s meant to replace the paper clay that comes in blocks, and it doesn’t have as smooth an appearance as the paper clay. I was wondering if sawdust could be mixed with the store bought paper clay and how that would affect the drying. I’ll keep searching and if I come up with anything I’ll let you know. Thank you so much for the info! I will pursue this link further and see how it works. If I make anything worthy I’ll post a picture. I have used paper clay from Michaels before but would like to try something I heard of…paper mâché with sawdust. However, I can’t find a recipe anywhere for paper mâché with sawdust. Do you have a recipe or know of somewhere I could check. Having fun looking at all your lovely masks and all the talented people here. Do you mean replacing all the paper with sawdust? I don’t know of a recipe like that. I’m not even sure what you’d search for on Google. Maybe “DIY clay with sawdust?” Sorry I can’t help. Maybe one of our other readers has an idea for you. I imagine somebody has asked this before, but a quick search hasn’t turned up an answer. Anyway, if you use a hand mixer to mix up the paper mache clay recipe, can you use that same mixer for its intended purpose? I.e., food? I’m just wondering if there are any concerns about whatever might be in the wallboard joint compound and contamination issues. Hi Elwin. I suppose you could, but I use a cheap mixer exclusively for the paper mache clay recipe. It tends to crawl up the beaters and get stuck inside the hole where the beaters are attached, and it’s hard to get it out. You wouldn’t want bits of it in your cookie dough. Thanks for the info. I’ve got a Kitchenaid stand mixer, but I’m a bit leery of using it to mix the clay. I don’t use it much and have been thinking about passing it on to my daughter and buying a hand mixer, hoping it could do double duty. Yes, in that case you might want to go to Walmart and pick up their cheapest hand mixer. You can get one for about $15, and it will work just fine. Ok….if my last attempts also post I appologize…my file was slightly smaller than 250 but I kept getting an error message so here is one more try….. Here is my elephant…lion is covered in clay but not yet painted…. Kathy, what error message did you get? The system doesn’t always work, unfortunately, but if I can see what it says is going wrong, maybe we can get it to work. I’m thinking about switching to a system that would work with Instagram hashtags – does anyone else think that would be easier? Hi Michelle. I rarely use glue when I make paper mache, so I might not be the best person to ask. However, transparent paper is often really fragile, so you might want to let each layer dry for a few minutes just to keep from ripping the paper as you apply the second coat of glue. But like I said, I’m not an expert. maybe someone else has some ideas for you – anyone?? Thank you for your help – I’ll give it a go and let you know! 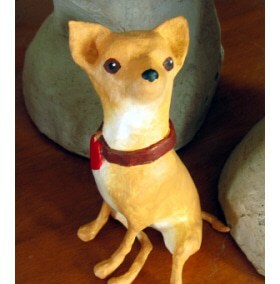 I love your paper mache clay and think it will work well to make the faces of our people. We will see! I use liquid starch. I think Jonni is right about needing a couple of layers. I have made many piggy banks using liquid starch, and two or three layers is strong. I would worry about them catching on fire, and I don’t know how flammable liquid starch is. Good luck. Would love to see them. I hope this loads “Lord Von Deerington! Oops, no. It didn’t work. Image need to be less than 25o kb, to keep them from slowing down the page. Have you tried this online image resizer? 500 pixels wide will usually be small enough, and still look great. Hello Jonni and Friends! This is my first post on this page. Let me start by saying that you have been a huge roll model and resource for me! I’ve been working with paper mache for 3 Years now. It all started with your videos and recipes. I can’t thank you enough! I came upon this medium when I was trying to make some fux deer heads that I wanted to dress up. I’m not a hunter and old Taxidermy is very expensive. So I made Two Deer mounts, they turned out get by the way. Lord and Lady Von Deerington. It has grown from there. Another aspect I love about this art form is that a lot of these projects are made from what would otherwise be trash. We make beautiful things from that! Thank you for being my inspiration and I look forward to sharing my work with you! Hanna!? Thanks, Hanna. I’m glad you’re enjoying the site and the videos. Do you have a photo of Lord and Lady Von Deerington? We’d love to see them. 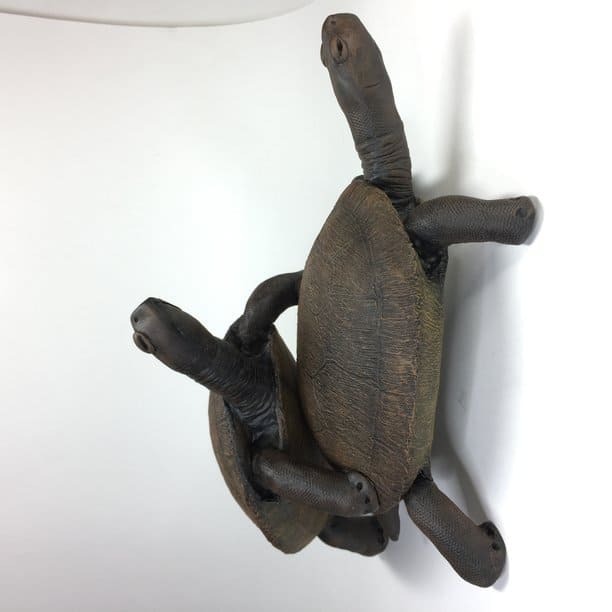 Here’s a pic of my recent project of a pair of turtles. The shells are covered in paper mache clay and homemade gesso for the shell pattern. The body parts are made with apoxie sculpt. It holds the details well, and since it’s adhesive, it’s also how the body parts are attached to the shell. I posted a time-lapse video of making them on my youtube channel.